I can't lie, I'm glad that the project is almost over. The movie-per-day pace is tough to keep up for too long, and I am bushed. Tonight's movie is the last of the Campy & B-Movie block, one that was suggested to me by Kyle. 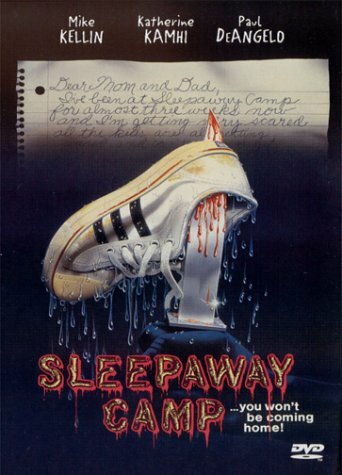 His reasoning was that it's kind of a campy movie, it's set at a camp, and it's one that I've never seen before, so it was perfect to use as a part of this block - Sleepaway Camp. Here's the problem with watching a movie that is nearly thirty years old - unless you live under a rock, it's nearly impossible to go into it unspoiled. I found out the twist ending of this one on one of those "I Love the '80s" shows that VH1 used to air. I was still curious about the movie, though, so I thought this would be a good time to finally check it out, and see if it can hold its own even if you are aware of how it ends. It's not really very scary. The kills are good, but are generally telegraphed enough in advance, or done enough offscreen that they don't leave you very frightened. Despite that, though, it's still a fun movie to watch. It builds the story well, gives you some good villains so that you have killings to anticipate, and keeps you wondering about the details, even if you do know what it's ultimately leading up to. Now, about that ending. On the extreme off chance that you don't already know Sleepaway Camp's denouement, I won't spill it here. It's one that an audience today would probably see and laugh, but I can see how it would have knocked a 1983 audience off their feet. What got me most was not the actual reveal, but Angela's face when it happens. She looks less like a human than like a cornered animal, and it's more frightening than anything that came before. Not bad. I give it three sleeping bags out of five. TOMORROW: I'll bring Return of Project Horror to a close with my Danny's Choice movie for this year. To find out what this one is, you'll just have to check back tomorrow. All I'll say is that it's probably not one you'd expect, and I'll be joined by a very, very special guest blogger.